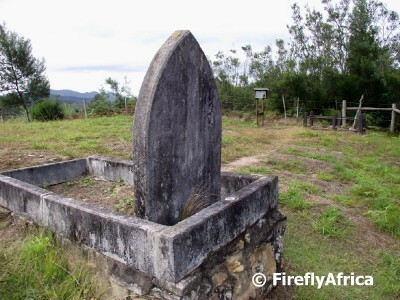 What would an expedition into the Knysna forest be without looking for some of the graves that belong to the woodcutters and miners from back in the days? My map of the forest showed "graves" close to Millwood and I ventured down a short narrow dirt road to have a look. The small sign at the gate called it the Old English Cemetery and it contained graves of both woodcutters and miners and their families. On the information board there were 34 names ranging in ages from 1 and 4 days to old age. The amount of ages in the 20's and 30's was actually astounding which just shows how harsh it was living in the conditions that these people lived in. The grave yard itself only had three or four graves with grave stones while the rest where nothing more than humps on the ground. I noticed another spot on the map that had graves that were accessible. It turned out to be on the property of Forest Edge which is an award winning accommodation establishment. The land that the property is on was part of the land that were given to some of the woodcutters to settle on after they were moved out of the forest and logging was seized. 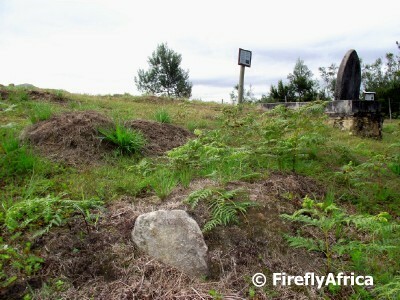 They were more than willing to allow me in to go and have a look at the graves which is on the edge of the forest. 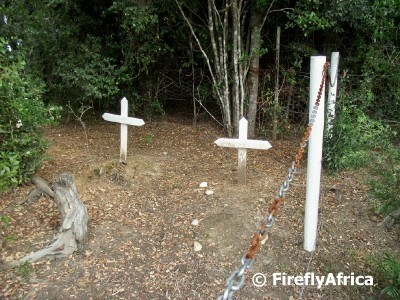 Again the graves was unmarked till the owners of Forest Edge marked them with white crosses. Although there are no records of who were buried here, two elderly ex-woodcutters who live close by have given them some indication of who some of the people may be. I cannot even imagine what every day life must have been like for those woodcutters. It is only through Dalene Matthee's books that one catches a glimpse of those lives in those days. Thank you for the photos.